I read about EES in a patient magazine a few weeks before starting chemotherapy for breast cancer, and I’m so glad I did! I ordered EES and started using it the night before my first treatment. I’ve used it consistently throughout my treatment, which has included 4 cycles of Adriamycin + Cytoxan followed by weekly Taxol, and still have my eyebrows despite losing my hair and eyelashes. I’m so grateful to have a way to preserve my eyebrows! Losing my hair and eyelashes was more upsetting than I ever imagined it would be, so being able to protect my eyebrows has meant so much. Thank you again! Patient retained eyebrows despite full body hair loss elsewhere. "I felt very fortunate to have access to this product!" Thank you for the opportunity to use this product during my chemotherapy. The ability to maintain my natural eyebrows during my treatment made a significant psychological difference when dealing with my other losses. With a wig, eyeliner and the preservation of my own eyebrows, others frequently commented on their amazement that I had not lost my hair…when indeed I had. The loss of eyelashes and the hair on one’s head are far easier to conceal than the loss of one’s eyebrows. I felt very fortunate to have access to this product! "The eyebrow solution has been a lifesaver for my confidence..."
I was diagnosed with breast cancer in August and started chemo at the end of September. I started using the eyebrow solution about a week prior to treatments. I did indeed lose all my hair on my head and everywhere else, but with the eyebrow solution, I still have eyebrows. While it doesn’t seem like a big deal, it’s huge for me! I feel like I look less like a cancer patient and when I wear a wig, nobody knows what I’m battling! The eyebrow solution has been a lifesaver for my confidence and has helped me feel more like myself. I’m so glad I found this website and so glad that I decided to purchase a bottle. I would recommend this product to anyone in a similar situation to mine or if you are dealing with any kind of eyebrow thinning! "Keeping my eyebrows made the whole process go much smoother for me." While having breast cancer and going through chemotherapy and radiation, I have been able to work full-time, and attend/present at many client meetings. I did so with confidence in knowing that my wig was such a great match to the hair I had before. I also learned about your eyebrow solution and hoped it would save my eyebrows. It worked! Keeping my eyebrows made the whole process go much smoother for me. I wish you great success with this product and I only hope other women like me find out about it. It’s a “best kept secret” … and needs to be widely shared with other women going through chemotherapy. "Thanks for a great product that actually did what it said it would do!" 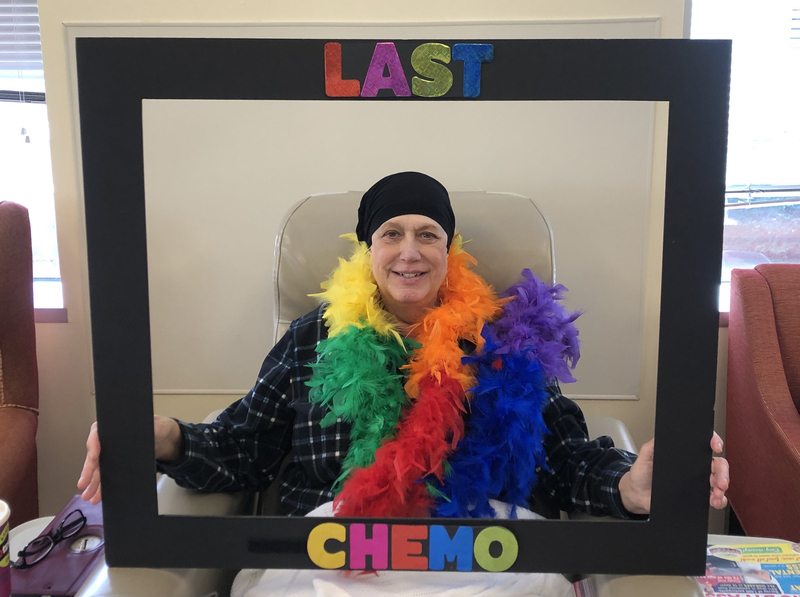 I started using EES right before chemo and now, 4 months later, I am finished with chemo! And I still have my eyebrows. YAY!!!!! No other hair though…. Thanks for a great product that actually did what it said it would do! "I am very grateful that I could use this highly-effective product and keep my confidence." My good friend, a doctor, Ms. Agnes Rathy brought me a bottle of EES from a conference for onkologists from the USA, in July, shortly after the beginning of my chemotherapy treatment. She advised me to use it and told me about your kind help and request to get information about the effectiveness of the solution. I am happy to inform you that the treatment was finished in September (every 3 weeks x 6 cycles), and I retained my eyebrows (despite full body hair loss elsewhere). They are a bit thinner than before but not significantly. I am grateful that I could use this highly-effective product and keep my confidence. Thank you so much! "This product offered me the ability to have control over one aspect of my physical appearance, during a time that I had very little control over anything." I was given the opportunity to participate in a trial for a solution that would help limit the loss of eyebrow hair during my chemo treatments. I happily accepted the opportunity and followed the instructions for daily use. Although I experienced full body hair loss, I was able to retain most of my eyebrow hair. This product offered me the ability to have control over one aspect of my physical appearance, during a time that I had very little control over anything. I would recommend this product to anyone facing similar circumstances. "I would highly recommend EES to anyone going through chemotherapy treatment." My experience with the eyebrow solution trial was a positive and successful experience. Retaining my eyebrows was so important to me. Losing my hair was one thing—I could get a wig to cover my scalp, but my eyebrows? One of the most important aspects of emotional survival is your self-image. If you are conscious about your looks, not having eyebrows makes it difficult to hold your head up and be strong. When I told my family of my cancer diagnosis and expected treatment, they, of course, asked if I was going to lose my hair. I told them, “Yes, I would lose all of my hair.” One of my young sons asked, “Even your eyebrows?” I told him, “Yes, even my eyebrows.” His response was, “You can’t, people with no eyebrows look creepy.” I thought about it and he was right. If you feel that you look “weird” or “different,” it will likely affect your psychological well-being and even your healing process. The key to a positive, successful treatment experience is a positive, upbeat attitude. Being able to keep my eyebrows enabled me to feel more normal, like myself and “keep myself.” As “myself,” I can conquer anything! EES was so easy to use. I just incorporated it into my daily routine. I would highly recommend EES to anyone going through chemotherapy treatment. "It was so easy and it worked." When I was diagnosed with breast cancer, I was determined to take it in stride. I wanted to keep everything as normal as possible and not have the cancer dictate my life. While watching “The Doctors” on TV, I learned about the Penguin Cold Cap to prevent scalp hair loss during chemotherapy treatment. I used it and it worked! I also learned through my sister’s neighbor about a solution that would preserve my eyebrows during treatment. Keeping my eyebrows during treatment was very important to me. It was so easy and it worked! All I had to do was apply the solution to my eyebrows twice a day. I strongly recommend it to others who are going through chemotherapy treatment. Renata, I have met some very nice people on my journey with cancer. You are by far the kindest and most generous person I’ve met on my journey, and in my life. Preparing for chemotherapy, I vainly and tirelessly searched for the best wig I could find. After discussing the fear of losing my eyebrows, along with my hair, at a wig fitting at a high-quality hair replacement studio in Auburn Hills, Michigan (Advanced Hair Solutions), I was told about the EES – Essential Eyebrow Solution product. I was given the opportunity to use it to help save my eyebrows during my breast cancer treatment. During chemo, a great wig makes you feel confident because you look “like everyone else.” But eventually, you also lose your eyebrows. Without eyebrows, it’s a lost battle—you look like a cancer patient with a wig. I loved this product, and this salon, and would recommend both to anyone facing hair loss, whether from chemotherapy or from other conditions/medications. When I first learned that I needed to undergo chemo, there were tears! All my life, my best physical features were my hair and eyes, so the thought of both being affected by chemo definitely hit the core of my self- image. I really had more concerns about losing my eyebrows because there was no good alternative for them, like a wig for my scalp. The loss of eyebrows screamed “cancer patient” to me and I did not want to be defined by this process. When the eyebrow solution was presented to me, I was definitely on board. I found the application effortless and the results were great! I would recommend EES – Essential Eyebrow Solution to anyone undergoing chemo. Thank you for your efforts in developing this wonderful product. It made a difficult time in my life much easier. I used EES during my chemotherapy treatments. As a result, I have retained almost all of my eyebrow hair even though I lost all other bodily hair (even my nose hairs). Both my oncologist AND my integrative doctor are amazed I have my eyebrows! Thank you! "I still have my eyebrows, despite losing full body hair loss elsewhere!" My chemotherapy treatments occurred (for Multiple Myeloma) between November 2012, and January 2013. The treatments entailed taking Revlimad pills (14 days on, one week off), Valcade shots (twice a week for 2 weeks, one week off) and Zometa infusions (once a month). These chemo treatments do not cause hair loss. However, two days prior to being admitted to the hospital for a stem cell transplant (March 20, 2013), I received a chemo infusion of Melphalan, which does cause loss of all body hair. I began applying the EES solution to my eyebrows on February 28, 2013. I have applied the solution twice daily, since February 28th. I still have my eyebrows, despite losing full body hair loss elsewhere! Just have to color them in with a pencil, like before! "I have to be honest - this was a life saver. " I am so happy that I was able to maintain most of my eyebrows through my chemotherapy treatment. I have to be honest—EES was a lifesaver. I could never explain how it has helped me mentally during a rough time. Losing my hair was one thing, however, with my wig and maintaining my eyebrows, I felt like I looked normal. "Actually, that's the ONLY hair left on my body." The EES solution worked very well for me. Actually, that’s the ONLY hair left on my body. I was very pleased with the outcome and would definitely recommend this topical solution to preserve eyebrows. "Successfully retaining my eyebrows made it much easier for me to feel good about my appearance when wearing my wig." As a chemo patient, I had not realized that I could lose my eyebrows as well as my scalp hair. When I learned about the eyebrow preservation solution, I was very pleased to participate in the study. Successfully retaining my eyebrows made it much easier for me to feel good about my appearance when wearing my wig. The product was easy to use, taking just seconds each day to apply. I would definitely recommend this product to anyone facing eyebrow hair loss from chemotherapy. "People are amazed at my results because I lost all my other body hair." Because I didn’t know about the existence of the eyebrow product, I started using it after my second chemotherapy treatment of Taxotere and Cytoxan, which I received every 21 days. I began applying the product as instructed, both morning and at bedtime. Although I witnessed a little eyebrow loss initially, I am pleased to report that I have maintained most of my eyebrows using this product. Now that my chemotherapy is finished, I continue to use it twice daily and continue to maintain most of my brow line. People are amazed at my results because I lost all my other body hair. I highly recommend this product to others–even if they are getting a late start as I did. "I did, however, retain most of my eyebrows, which I credit to the use of EES." I used the EES solution during my 20 weeks of chemotherapy. During that time, I did indeed lose hair all over my body: scalp, arms, eyelashes, legs etc. I did, however, retain most of my eyebrows, which I credit to the use of EES. Thank you for creating this amazing product! "I also tell everyone about the "eyebrow” solution that I used. It worked!" After being diagnosed with breast cancer, I visited Advanced Hair Solutions and bought the most beautiful wig and was treated so kindly that I will never forget my experience. Since then, I have been asked several times where I got my wig. Everyone, and I mean everyone, loved my wig. I also tell everyone about the “EES eyebrow” solution that I used. It worked! Thank you so much for all the help and support that you gave to me during a very difficult time. It was very important to me to keep my eyebrows during my chemo treatment. I did not start using the eyebrow solution until after I had my first of four chemo treatments. I did keep my eyebrows through all four treatments. Every single bit of hair was gone from my body, including my eyelashes, but I still kept my eyebrows. I did end up losing some eyebrow hair after completing the chemo treatments, even though I continued to use the solution. I was very satisfied with the solution and would highly recommend it to others. It was very easy and convenient to use. I just included it in my nightly face washing and cream routine. Thank you for making me feel better about myself. “Thank you for helping me during one of the toughest times in my life." I am so happy that I never lost my eyebrows during chemotherapy treatment. Thank you for providing me with the EES eyebrow product. I feel good for the most part and want to thank you for helping me during one of the toughest times in my life.